Dark is one of those truly original novels that are always slightly hard to summarise to people who haven't read them. I remember trying to talk about Catch 22 when I first read it, and coming up with something garbled about time repeating and people buying and selling themselves eggs and isn't war horrendous but also very boring? So, with that caveat in mind, here goes! Dark is a story set in a pitch-black world where everything is described via sounds, smells and feelings. It stars three intrepid, highly evolved Guinea pigs who must find out why all the fish in the river are dying and in so doing stumble upon a burgeoning war. Well, I did say it was difficult to summarise! You can read the back-blurb here, which does a much better job than I have managed. In fact, despite the story's pitch black setting, a lot is made to clear to the reader, who is rewarded with a rich and intricately designed narrative world. We aren't told immediately that everything is black nor, naturally, what the protagonists look like. Instead, we are treated to a vision of life that is understood and made sense of via various other senses, most specifically sound, smell and 'air sense', which I imagine to be the use of whiskers to follow air currents and estimate depth and breadth and so on. Time is measure in spans and clicks. Monetary value is managed via etchings, mapping and writing via braille. The sheer attention to detail and imagination that Arvidson employs in creating this world is remarkable and thoroughly engaging - even if, like Catch 22, it takes a few chapters to orientate yourself. This is by no means a criticism of the work, either. The slow and steady world building and character development in Dark are immensely rewarding. The three main characters, Dun, Padg and Tali, are excellent company with whom to explore this world, and because they are setting out from their home, the reader is able to learn about the world with them. And what a world it is! What begins in a very localised space, the village where the River Folk live, opens up into a vast, underground network of pipes, machinery, defunct electronics and strange, frightening creatures. There is definitely a mystery here regarding exactly where we are, though the when seems to be in a far flung, post-human future. Dun and co's story is interspersed with snippets of a logbook, recorded by a (human?) explorer. It is this element that has caused me to label this novel primarily as SF, despite it's sometimes fantasy structure (the band of three leaving home to explore their world in order to save their home). This is a post-technology land, with a species of animal that have clearly evolved well beyond their current state. The question then becomes, where are they and how did they get there? And, in almost Douglas Adams style, what's with all the dead fish? There are plenty of twists and turns to keep the reader engaged, and the three main characters are well-realised and individual. Dun is the hero of the piece, but Padg and Tali are excellent companions and, due to a separation at the end of the novel, I'm excited to spend more time with them both in the second installment (Darker, which is available now). Joining our three explorers is the mysterious Myrch, who was by far my favourite - but then, I've always had a soft spot for a morally gray character, and Myrch is certainly that. For those of you who know me, you'll also know that I am a big advocate for multiple female characters in novels, and Dark begins and ends well in this regard, though there is a middle period where Tali is the only central female character - due, of course, to the fact that we are following the central three on their journey, rather than any egregious omission on behalf of the author. Besides, Tali is great, a kind of cross between Hermione and Q from James Bond, and by the end of the novel we are reintroduced to a host of interesting and agented women (females?). There are some moments when I found the pacing to be a little jumpy and there is rather a slow start, but once the gang are off on their adventures everything picks up speed and I raced to the end. Dark finishes on a cliff-hanger, but as the second book is out now you can read it straight away - and I expect you will want to! I will say that this may not be a book for a casual reader. The nature of it, it's structure and the way that Arvidson has designed his world, can be challenging at times. One must use their imagination, and if you are used to being spoon fed by a story this may be something you find hard at first to acclimatise to. For my own part, I loved this element of Dark. The comparison I make above to Catch 22 is, I think, valid. I remember reading Joseph Heller's amazing novel when I was about sixteen or seventeen years old and having never encountered anything like it, I struggled at first to follow what was happening. Then it all clicked, and I was transported fully into his world. Not only that, but Catch 22 opened up to me a whole new idea of what fiction could be and what it could do. I suspect that any fans of speculative or avant garde (for want of a better term) fiction will have no problems at all with Dark, and will, like me, really enjoy the experience of reading without relying on the sight of the characters to make sense of the world. Not only that, but the story itself is - most importantly - interesting and engaging, with characters and mysteries that will keep you turning the page! Dark is available on Amazon as an e-book and in paperback, and the e-book is free to download. If you join Arvidson's newsletter here, you will also receive a free collection of short stories set in the same universe, entitled Darkish. 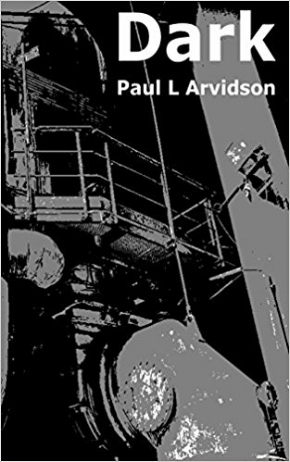 Paul L. Arvidson can be found on Twitter, Facebook, and Goodreads.